Mad Max: Fury Road is a double-barrelled shotgun enema straight to the senses that isn’t just daring, fascinating, a thrilling jolt of original energy, or the best thing you see this summer. It’s a 21st-century feminist take on John Ford’s classic “Stagecoach” that’s essentially a full-blown feminist blockbuster. It’s a gleefully violent... phantasmagoria that turns epic road rage and long stretches of vehicular omnicide into an eye-boggling joy ride that [invigorates] the way a big cinema spectacular should be, and that’s awfully refreshing. What’s it about? That doesn’t matter, silly! What matters are the car chases! The story is told visually, like silent cinema, and without recourse to whiplash editing or excessive CGI. For two breathless hours, the vehicular mayhem never lets up. After all, this is a maniacal chase picture that delivers max action and max carnage at max volume. Max everything! It is, in fact, summertime entertainment ... to the max! Did I mention it’s a feminist text? I did? Well allow me to repeat myself. 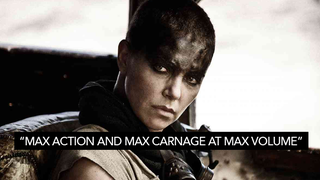 Mad Max: Fury Road is both improbably and surprisingly feminist, a blessed deliverance from the tiresome universe-building, sanitized violence and rampant sexism of, say, the bloated Marvel epics, and most of that is thanks to Charlize Theron’s dazzling work as Imperator Furiosa. You know what? I wouldn’t be at all surprised if Theron collected her third Oscar nomination (she won Best Actress for “Monster”). Tom Hardy is great too! He’s an ideal replacement for Mel Gibson that one wouldn’t want to imagine anyone else having taken over the role. But back to those action scenes! They’re high-speed, jaw-dropping and startlingly well-choreographed. And for all the chaos erupting at all times, we never lose track of what’s going on, because it’s been staged not just with diabolical mischief, but also total clarity. That’s mostly thanks to George Miller, who directed the original Max Max films. He blows away younger action directors with analog filmmaking at its most daring that leaves a CGI contraption like “Furious 7” stalled at the starting line. Miller’s car chases showcase his inexhaustible genius for making the most out of what are basically just objects moving through space and render almost every previous car-chase movie instantly redundant and enervated by comparison. Yep, that man can direct an action sequence far more skillfully than those turned out by most young turks half his age. And you know what? Spend the extra dough on 3D. That newfangled format brings out the virtuosity of Mr. Miller’s old-school approach that leaves a generation of blockbuster cinema choking on his dust. Wow. What a movie. Truly an astonishing work of art. Yup. It’s maddeningly good.